next April 8, 2015 5:43 p.m.
Times Square has always been about reinvention — in order for the New York Times' headquarters to be built (and give the spot its name), the Pabst Brewing Company's Pabst Hotel had to be demolished. 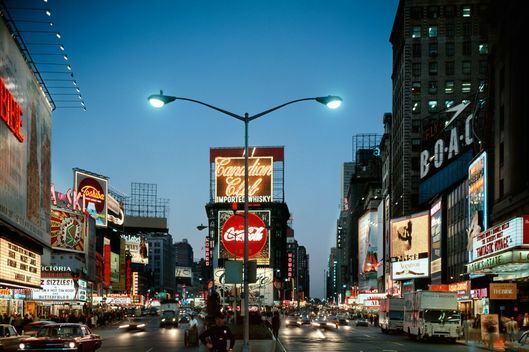 But in the late 1970s, after decades of grandeur followed by decades of decay, imagining the future of Times Square became a particularly pressing project. 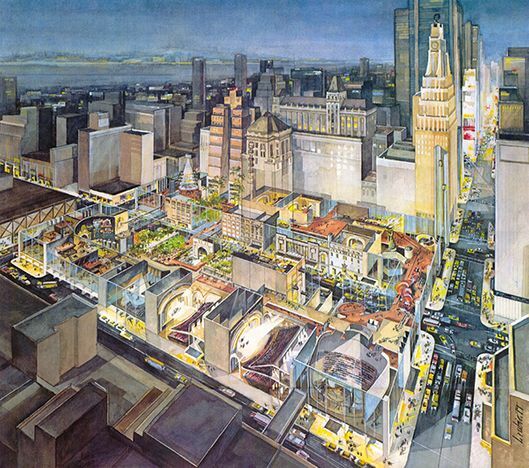 Mayors John Lindsay and Ed Koch led the reforms, and by 1979, the nonprofit 42nd St. Redevelopment Corp. stepped in with ambitious plans to clean up the iconic cesspool. That era of redesign continued through to the Disneyfication of the neighborhood, and today, designers and architects are still trying to reimagine this one, singular place. 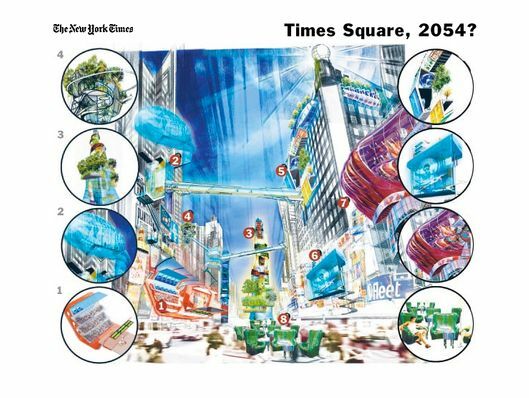 What will Times Square look like when your grandchildren are hurrying through? Here are some plans for the future of Times Square, some of which never caught on and some of which still have a chance. 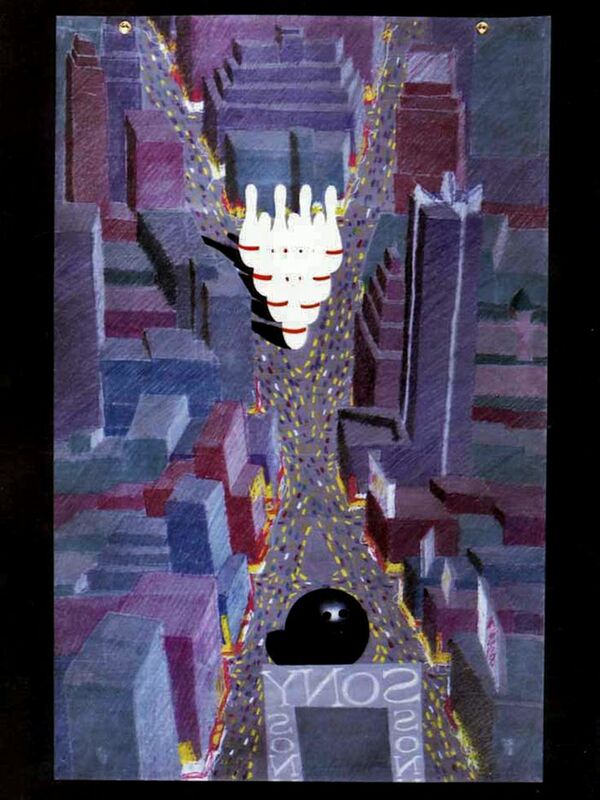 Poster of "The City at 42nd Street." Courtesy of Cooper, Robertson & Partners. Photo: 42nd Street Development Corp. In an ambitious effort to save the Square, the city and state came together with an official redevelopment plan. The $1.6 billion project aimed to revitalize a 13-acre swath of land, from Eighth Avenue to Bryant Park. New skyscrapers were to be built, seedy theaters taken over, peep shows evicted, and a wholesale merchandise mart built across from Port Authority. Though the details changed, the plan to sanitize Times Square was eventually executed. In 2010, the Times declared the “rebirth” complete. 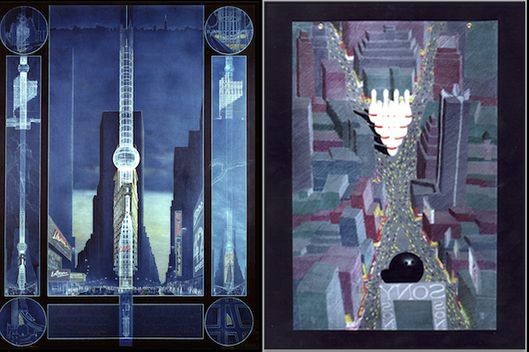 2 of the entry boards for the 1984 MAS "ideas competition" for alternative proposals for Times Square. Photo: Lee Dunnette, William (Chip) Sloan. The city-state plan initially included the virtual demolition of Times Tower, the building better known as One Times Square. While it would technically be kept standing, the building would exist as a “steel skeleton, which would be painted and used as a truss to support an elaborate system of lights and signs,” according to a report in the Times. 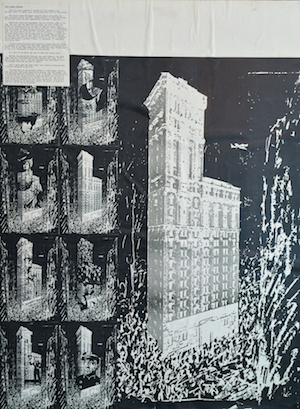 Unsatisfied with this plan, the Municipal Art Society of New York launched a competition. Any architect with an idea for redesigning Times Square’s centerpiece could submit it, and many did. Well over 500, according to the Times. The ideas are wild. One version looks like a totem pole with a giant sphere built right into the building. Another called for covering it in lightbulbs that would be strategically turned on to display the faces of bygone Broadway stars, like a rudimentary LED screen on the face of the entire building. The best suggestion involved turning Times Square into a huge bowling alley and replacing Times Tower with 10 enormous pins. 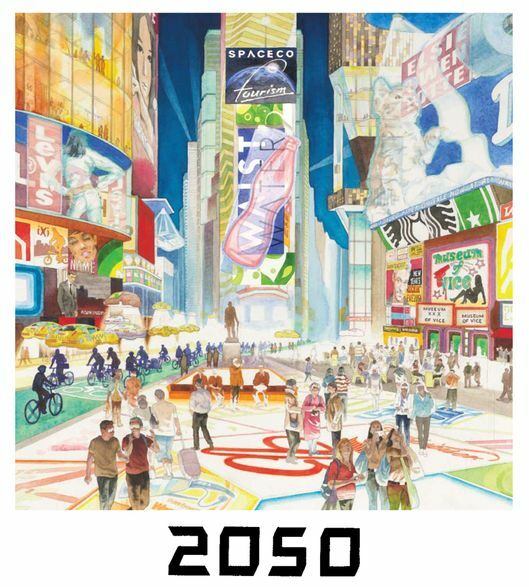 To celebrate Times Square's 100th anniversary, the newspaper that gave the neighborhood its name assembled a panel of “visionary” architects, designers, artists, and writers to think about Times Square in 2054. They imagined 3-D advertisements (good call! ), a vertical park, a floating playground, and an infinity pool that doubles as a projection screen. 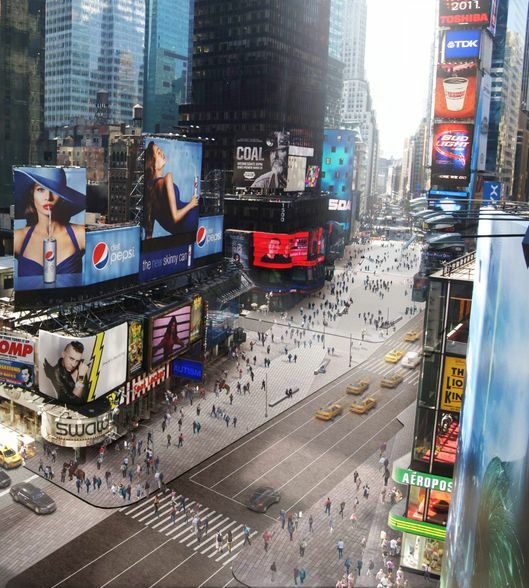 Unveiled in 2011 and set for completion in 2016, plans from architectural firm Snohetta call for turning much of Times Square into a permanent plaza. Stone pavers with inlaid stainless-steel pucks to reflect the lights above will be laid out across the plaza, leveling the ground. No more curbs, no more street structure, and no more crowding. (At least, that’s the idea.) The first phase of construction was completed in 2013, with the rest set to be complete by the end of next year. When it’s all done, Snohetta imagines the Crossroads of America will look like the image above. In his book One Times Square: A Century of Change at the Crossroads of the World, artist Joe McKendry tells the history of Times Square with illustrations. But he also projects the future. This image shows Times Square in 2050, complete with light-up walkways, a dedicated bike lane, 3-D signs, and a Museum of Vice. 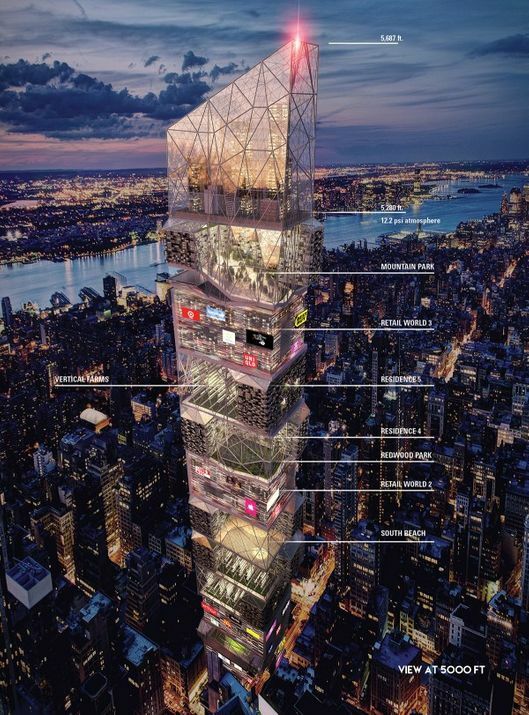 As a part of eVolo magazine’s 2015 skyscraper competition, a team of designers came up with a new building for Times Square that they call Times Squared 3015. The tower is a vertical city unto itself, with oversize floors that are home to beaches, mountains, stadiums, shopping complexes, and housing units. Getting around the complex would be easy for its 32,000 inhabitants, thanks to an internal subway system and a series of elevators and escalators. The building would need to be enormous, obviously. The proposed height of 5,687 feet more than doubles the height of the world's tallest building, Dubai’s Burj Khalifa. The promise of Times Squared 3015 is a city within a city, in which residents could live, work, and play without every leaving. Sounds a little creepy — although if living there meant never having to navigate the crowds of tourists on the ground, it could make a lot of New Yorkers very, very happy.